September 12, 2016 | By jmitchell | Filed in: Communication, Early Literacy, Language, Making Materials. I have decided to develop a few of my own interactive books so that I can give them away and avoid copyright issues. I believe it is important to focus on Core Vocabulary words even with verbal students. Most Core Vocabulary words are also found on sight word lists (Dolch, Fry…). Print each page, laminate, and bind. 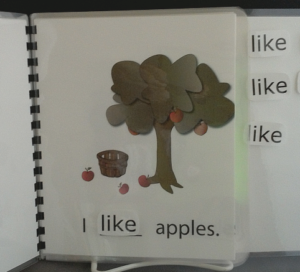 Cut out the target words and place Velcro on the back of the word and in the book where the word should be placed. If you’re interested in other books and activities with a Autumn/Fall theme, I have a Language, Literacy, and Communication Kit for sale for $5.